From the basic idea of ​​communication between cars, the concept of Hovering Data Cloud system developed. This article is named Fundamentals on Hovering Data Cloud as the basic is being discussed for clarifying concept. The formation of congestion on highways has several causes. For one thing, there is no centrally controlling entity. As a result, every road user drives his personal driving style. Another reason is the unused capacity of the highway. It can be observed that the right lane of trucks is driven at a great distance from each other. Whereas in the fast lane many cars drive at close range. This is due to the fact that the drivers of the cars do not drive in the gaps between the trucks, as they doubt to be left on the left lane. Other reasons include construction sites or accidents on the road. The high traffic density plays an important role in these mentioned causes. Scientific research on traffic jam shows an enormous waiting time in a traffic jam. The road traffic accident statistics show high numbers of accidents in which peoples died. Communication networks between the vehicles should reduce these accident and congestion figures. In this case, warnings about the dangerous situation, for example, a vehicle that has remained behind are to be transmitted to subsequent vehicles with the aid of sensors. But there is need of infrastructure to increase the safety in traffic. In our previously published article, we discussed about communication between vehicles. In order to implement these ideas, the companies like Audi, BMW, Daimler, Chrysler and Volkswagen joined to form a car-to-car communication consortium. A standard developed by the C2CCC for communication between vehicles and infrastructure to make the technology accessible to every consumer. This in future, will reduce congestion on highways and to pass on information about the infrastructure, for example, the switching phase of a traffic light to the road users. The communication finds its source or destination in an infrastructure facility (eg traffic light, street sign, etc.). This is referred to as vehicle-to-infrastructure communication (in short: C2I communication). A vehicle is the source or destination of the communication. This form is declared as vehicle-to-vehicle communication (in short: C2C communication). Vehicle-to-vehicle communication is a self-organized and communicating network that automatically reflects hazards and forwards the warning messages. To make behavioral decisions when negotiating joint driving manoeuvres, a top-down approach is chosen. This means that initially cooperative groups of vehicles are formed. Subsequently, a site plan is created in each group, which depicts all objects and their location in the group and serves as a basis for the situation recognition and behavioural decision. There are two aspects to consider when grouping. The complexity and thus the difficulty in recognizing the situation increases the larger the group is. This leads to more difficult decision-making. Therefore, the choice of a suitable group size is needed. It makes sense to classify vehicles that perform a joint driving manoeuvre in a group. This makes meaningful behaviour possible in the specific situation. With the help of an educational criterion, groups can be formed, which contain these two aspects. It can be said roughly that the basis for the calculation is the distances between the individual vehicles and a defined evaluation function for cooperative groups. In the field of wireless communication, there are many different techniques. From classical way such as simple radio links and infrared to modern technologies such as Bluetooth or WLAN, by every means of C2X communication must be tested. However, some of the candidates can be quickly eliminated. The classic radio describes the simple “analog” way. Here, complex information that is important for C2X communication is not transmitted. Only a simple speech signal is transmitted. GPS information, distances or even speeds are not transmitted. Infrared requires a constant visual contact of the two transmission partners. This contact in normal traffic can not be guaranteed by large and small bumps and optical obstacles. In addition, only two vehicles can communicate with each other via infrared. Rapid dissemination of, for example, an emergency signal is thus ruled out since a separate connection would have to be established for each vehicle in the vicinity. 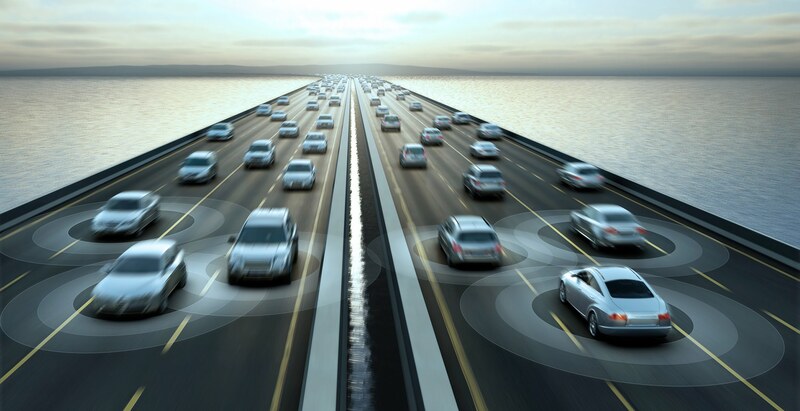 Consequently, many sensors would have to be distributed on a car in order to be able to communicate with several vehicles in all directions. Bluetooth is not suitable because it only has a short range. Without special amplifiers, the range is a maximum of 100 meters and is already severely limited by walls or similar obstacles. The oldest standard 802.11 offers only a very low transmission power of 2 Mbits/s. The Global Positioning System (GPS) enables the exact determination of the current position of a GPS-capable system on Earth. It was developed early ’70s from the Department of Defense of the United States as a military system, but is now available also on the civilian population. At least 24 satellites are distributed around the globe so that anywhere between 4 and 10 satellites are “visible” from anywhere in the world. The vehicles are the carriers of the information, which are intended to be moving. As a result, the data structures that contain information about the traffic situation that has occurred constantly change their host computer. The problem with passing traffic information is in some traffic situations like an accident, parking where the vehicle remain stationary. The solution is the Hovering Data Cloud method developed describes a dynamic traffic reporting. The data cloud contains the data involved of all vehicles that are within a certain radius of the starting point of the Hovering Data Cloud. There are two types of Hovering Data Cloud. One is the static hovering data cloud, which is bound to a fixed point. The other is dynamic Hovering Data Cloud, which measures a position that can be changed to a place. The static Hovering Data Cloud can be thought with application example of a traffic light. The dynamic Hovering Data Cloud can be thought for traffic jams. This Article Has Been Shared 9662 Times! Theoretical Foundations of Big Data is second part of our series of articles. We have talked about data privacy & basics of data warehouse. Cite this article as: Abhishek Ghosh, "Fundamentals on Hovering Data Cloud," in The Customize Windows, November 10, 2017, April 25, 2019, https://thecustomizewindows.com/2017/11/fundamentals-on-hovering-data-cloud/.